Although Krishna Janmashtami is celebrated throughout India but celebrations at Mathura and Vrindavan are the most significant one. Mathura city attracts maximum number of devotees and tourists during the time of Janmashtami. The center of attraction and devotion is the birth place of Lord Krishna which is famously known as Janmabhoomi temple. This place gets its significance for being the exact place of the birth of Lord Krishna about five thousand years before. At Janmabhoomi temple, the celebrations begin five days before of Janmashtami and continue even after that. Various plays which are famously known as Krishna Leela(s) are organized during these five days which are watched by thousands of visitors and devotees. Although couple of temples are built within Janmabhoomi compound, but the most famous temple which is also the tallest one is known as Keshava Dev Temple. 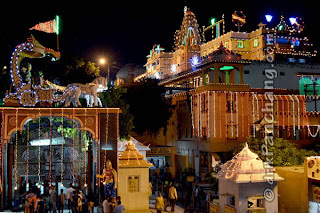 Keshava Dev Temple is lavishly decorated with colored lights ahead of Janmashtami. The decorated shrine of Keshava Dev is equally admired by tourists as well as local devotees. It is Bhagwat Bhawan of Keshava Dev Mandir where the birth of Lord Krishna is replayed every year. The Janmashtami celebrations reach its peak during midnight when the birth of Lord Krishna is re-played. The deity of Lord Krishna is given grand Abhisheka and Panchamrita thus formed is distributed to devotees along with Prasad. The maximum security is provided to Krishna Janmabhoomi at the time of Janmashtami celebrations. Special arrangements are made to control the mass of devotees.